The Moët & Chandon (Moët et Chandon) Champagne brand was once a favorite of King Louis XV and is still toast-worthy today, with some 30 million bottles produced annually. Visit the brand’s headquarters in Epernay, France, to tour vast underground cellars, learn how Champagne is made, and taste a selection of Moët & Chandon products. The Moët & Chandon Champagne cellars are a highlight for visitors to the Champagne region, with roughly 17 miles (27 kilometers) of tunnels and vaults filled with aging bottles. Take a guided tour to explore the cellars on foot, get a behind-the-scenes look at the brand’s historic Champagne- and wine-making processes, and sample a selection of Moët & Chandon’s famous vintage Champagne varietals. Some tours feature the season’s newest wines, while others highlight Moët Imperial or a rosé variety. Full-day Champagne tours from Paris or Reims typically include a visit to the Moët & Chandon cellars. The Moët & Chandon Champagne cellars are a must-see for wine and Champagne lovers. Cellar tours involve a fair amount of walking, so wear comfortable shoes. The cellars are usually chilly, so it’s a good idea to dress in layers. Cellar tours are typically wheelchair accessible. The Moët & Chandon Champagne cellars are located in Epernay, roughly 90 minutes from Paris and 40 minutes from Reims by train. Travel times by road are about the same. The cellars lie within a five-minute walk from Epernay’s main train station. The cellars are open daily from April through January, and on weekdays only in February and March. Visit during February or March to avoid crowds, but expect cold temperatures. The fall harvest season is a picturesque time to visit, when the vineyards are washed in golden colors. Summer is the busiest time of year; during this time, it’s best to opt for an early morning tour to avoid crowds. The Moët (pronounced “mo-ett”) & Chandon company was founded in 1743, during the reign of King Louis XV. The brand’s Champagne was a favorite of the monarch and soon rose to fame throughout France, with famous aficionados such as Napoleon and Queen Victoria of Great Britain becoming quick fans. Now under the umbrella brand of LVMH (Moët Hennessy Louis Vuitton), the brand continues to hold its prestige. Experience fine French bubbly on a full-day trip to the Champagne region from Paris. Accompanied by a guide, travel through the beautiful vineyards of Epernay and descend into the Champagne cellars of Moet and Chandon. Continue onto Hautvillers, birthplace of Champagne pioneer Dom Pèrignon. Enjoy a last visit at a family Producer where you will have the opportunity to taste 4 different Champagnes before heading back to Paris, filled of unforgettable souvernirs.. Tastings and entrance fees are included. Discover France’s exquisite Champagne country on this 10.5-hour history and tasting tour from Paris. In a small group, wind through verdant hillsides en route to wine estates, a distinguished Champagne house and the charming city of Reims for a tour of the famous Gothic cathedral. Your tasting adventure includes guided tours of vineyards and champagne cellars, complimentary samples of sparkling wines and a traditional French lunch. Learn the ins and outs of the world’s most celebrated sparkling white wine during this VIP day tour through champagne country. Go behind the scenes at a Benedictine Abbey, where Dom Perignon pioneered early production methods, and learn how champagne became synonymous with celebration at a family-run winery. Tours include breakfast, free time to grab lunch in the world’s champagne capital, and a tour of the famous cellars of Moët. If you’re a fan of the bubbly, you’ll appreciate this full-day tour to the heart of the Champagne region. 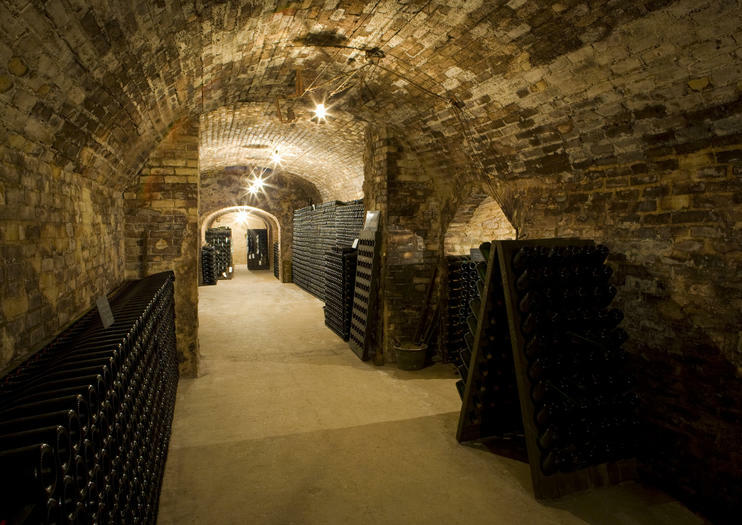 The tour begins at the Moët & Chandon headquarters, where you’ll enjoy a tasting and tour of the underground cellars. Walk the famed Avenue of Champagne—home of the world’s best champagne houses—learn about the history and terroir of the region, and enjoy a leisurely lunch and tasting at a local winery. Discover the delights of Champagne—both the drink and the region itself—on this full-day excursion from Paris. You'll visit three different Champagne houses, including Moët & Chandon, to learn about production methods, see the cellars, and hear about the history of this beloved sparkling wine. Enjoy several tastings as well as lunch at a vineyard. Round-trip hotel transportation is provided so you don't have to worry about getting there yourself. Sip champagne in the beauty of the French countryside on this day trip from Paris. Visit the stunning Cathedral in Reims, walk the Avenue de Champagne in Épernay, explore vineyards, and sample delicious champagnes. Your Sommelier guide will share the secrets of France’s beloved sparkling wine. This tour includes comfortable round-trip transport from central Paris. Tantalize your taste buds with a full-day tour from Paris to the heart of France’s famous Champagne region. Visit the UNESCO-listed town of Reims, where centuries of French kings were crowned at the Gothic Notre-Dame de Reims cathedral. At a top-rated winery, learn about the traditional Champagne-making process and sip several different kinds of the beloved bubbly paired with a gourmet multi-course lunch of traditional delicacies. It’s a fantastic way to experience the one and only home of authentic French Champagne. From Paris, JB owner and guide, will accompany you all day to make you discover its region and its vineyards. JB will make you discover the wines of Champagne, the local traditions and the products of his childhood. You will visit 3 Champagne houses. 2 of the most prestigious and 1 family.At the end of the day you will taste at least 8 different wines, but also cheese and various local products. The story is a great passion of JB, it will share with you the great historical events that took place in Champagne (World War I).The authenticity, comfort and exclusivity of this day in Champagne will enchant you. Toast your travels with Champagne, the "drink of kings", during this 10-hour guided tour from Paris. Visit some of the most famous Champagne producers, including a private Champagne estate. Descend into the chalk cellars on the Avenue de Champagne in the town of Épernay to see where the exclusive bottles are stored and explore the town of Hautvillers, home of the famous monk Dom Pérignon. Tour the grounds and taste three Champagnes at a private, family-run Champagne estate. Discover the vineyards of the famous Champagne region on this private 10-hour tour from Paris. Your personalized guide takes your group of up to six people to taste delicious bubbly at a top Champagne producer, such as Moët-et-Chandon, Taittinger or Veuve-Cliquot, as well as one smaller producer in La Montagne de Reims or Marne Valley. Visit the historic town of Hautvillers and learn how Champagne began with a monk. Stop by Reims Cathedral, where the kings of France were once crowned, before returning to Paris. Soak up the ambiance of the Champagne region of France during this private tour in a luxury minibus. Departing from Paris, spend 10 hours exploring the region where the world's most famous bubbly is made, including a visit to historic Reims and the Reims Cathedral. Learn about the history and culture surrounding the region and its products from your local driver/guide. Visit several wineries, including Moët et Chandon and Epernay, to learn about the champagne-making process. Along the way, eat a typical French lunch accompanied by local champagne with your private group of 7 people or less. Round-trip transportation from your accommodation in Paris is included. Reims is the gateway to the world-famous Champagne wine region and this tour offers a perfect introduction to the iconic bubbly. Drive along Champagne Avenue in Epernay, visit the Moet et Chandon Champagne house, follow in the footsteps of Dom Pérignon in Hautvillers, and enjoy Champagne tasting at a family-run vineyard. Uncover the secrets of France’s favorite sparkling wine with a visit to the Champagne region. Walk the Avenue de Champagne in Epernay, learn about the production of this celebrated drink in Passy-Griny, and sample different types of Champagne before your return to Paris. 1h45 de Paris con coche privado. Una excursion a medida donde visitaremos el Museo del Champagne de la bodega Collet (entrada incluida), con una degustación incluida. Andaremos en las viñas con los comentarios de los especialistas de la bodega. Veremos todo el proceso de fabricación. Pasaremos en Epernay ver a los famosos sedes de las grandes marcas en la "avenida del Champagne" donde se siguen las majestuosas fachadas de Mummm, Moët, Chandon, Mercier (UNESCO). Desayuno libre, se los indicaran varios restaurantes según su presupuesto, o bocatas de las panaderías francesas ! Terminaremos en Reims, para visitar la catedral de Reims, lugar donde fueron consagrados 35 reyes de Francia ! Combine visits to two of the most well-known wine-growing regions in France in a single day tour from Paris. With all transportation provided, you can enjoy the scenery of rolling hills and vineyards, in addition to avoiding the worries of who will be your sober driver. Stop at multiple wineries in the Champagne and Loire Valley regions, where you'll tour the vineyards and tasting rooms, as well as taste the product. A gourmet winery lunch and a visit to the Chambord Castle round out this action-packed tour.